I'm cross posting this story from Jewish Heritage Europe the new go-to site for information about Jewish heritage sites in Europe. I helped begin and edit this site about six years ago but it fell into stagnation. The Rothschild Foundation and journalist, author and blogger Ruth Ellen Gruber have revived and remade it into something much for appealing - and up-to-date. cehck out the entrie site and subscribe to the Facebook link, too. A dilapidated small Jewish prayer house in the town of Kielce is to be moved from its current position in the back yard of a tenement house to nearby the Jewish cemetery in order to rescue it from falling into total disrepair and to enable development of the tenement site. A report in a local Kielce newspaper, and quoted by Virtual Shtetl, said that the 54-square-meter private prayer house was built in 1922 at 3 Slowackiego by a local entrepreneur named Herszel Zagajski, who owned a limestone plant. [T]his house is one of three such buildings in Poland that have survived to the present day. Additionally, in Kielce, for historical reasons, it has become a symbol. The whole action enjoys the support of the Chief Rabbi of Poland and the Jewish Community in Katowice. Cutting the building, its transportation, reconstruction and renovation, which pose the most difficulties, will be completed by the Dorbud company. Presently, drafts, plans and necessary agreements with the monuments’ restorer are being made. The company wants to obtain subsidies from the Fund of Norway. In all probability, the building will be transported to the municipal land next year. 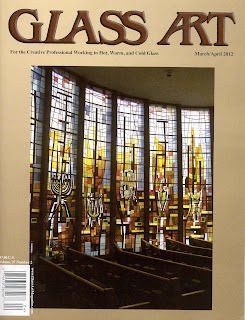 Here is a photo credit I didn't expect - the cover on 'Glass Art'. 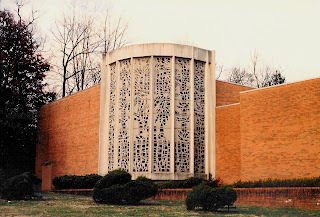 It's a synagogue window at Congregation B'nai Jacob in Woodbridge, Connecticut from the early 60's by artist Jean-Jacques Duval. 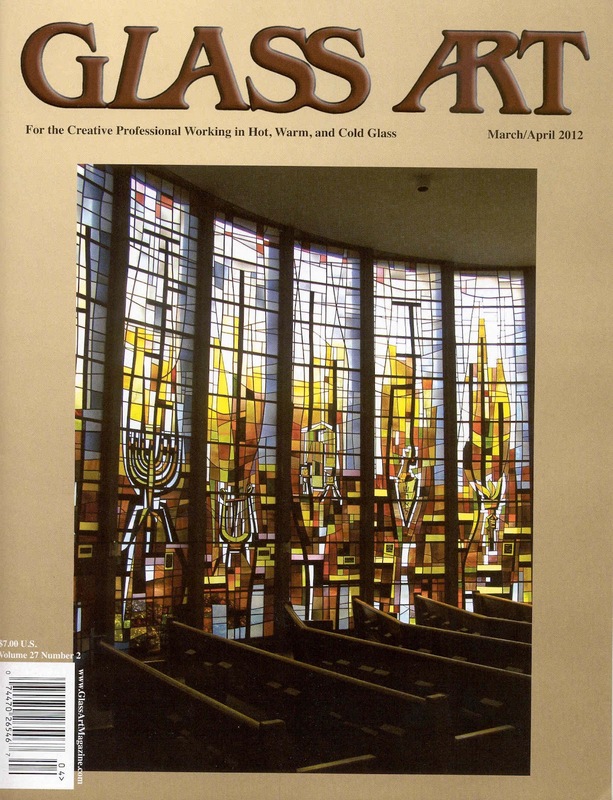 Glass Art has a profile of Duval, who is till actively at work. I blogged about his work earlier in the year and am quoted in the article. 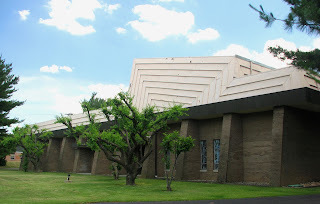 You can read my earlier account and see more pictures at http://samgrubersjewishartmonuments.blogspot.com/2011/06/usa-jean-jacques-duvals-connecticut.html. After I posted that piece last June, I heard from several people. 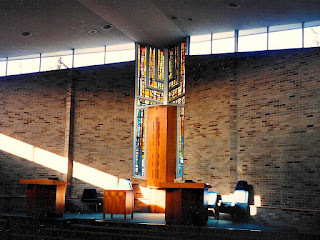 Contemporary artist Jeanette Kuvin Oren, a member of Congregation B’nai Jacob in Woodbridge, CT. sent in a photo of the Ark curtain she made in the 1994-95 for the Jewish Theological Seminary inspired by Duval's glass. 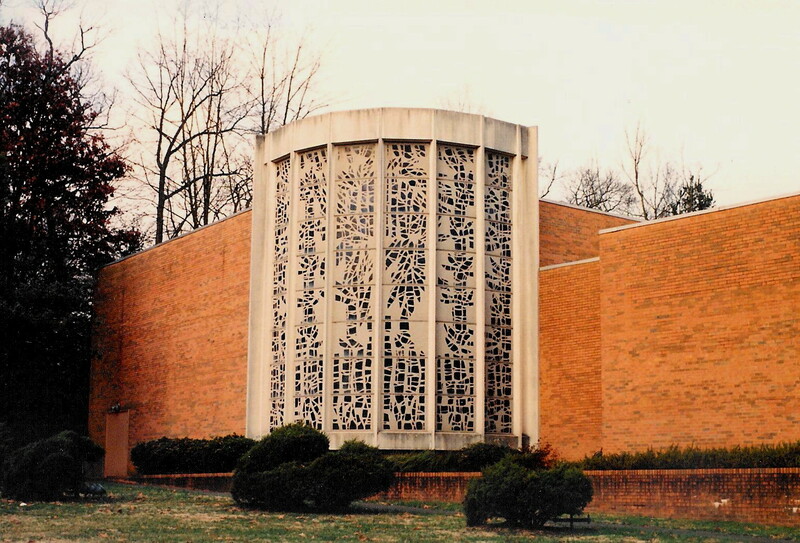 Synagogue maven Julian Preisler sent in these three photos of contemporary synagogues with Duval windows. Binghamton, NY. Temple Concord. Photo: Julian Preisler. Steubenville, OH. Beth Israel. Photo: Julian Preisler. Knoxville, TN. Heska Amuna.Photo: Julian Preisler. We still need to get better pictures of the sanctuary interiors with all the glass. Thanks Julian!